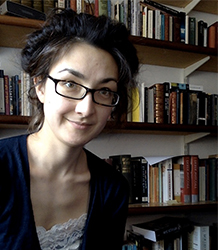 Natalie’s research interests are in twentieth-century and contemporary literature and critical theory, especially Anglophone poetry and fiction. She has research interests in global identities, the philosophy of language, pedagogy and knowledge. She has published on scholarship and stupidity, commerce and literature, avant-garde and mainstream writing, and on the ethics of bickering, rudeness and address in the South African novelist and scholar J.M. Coetzee. Her first book, Speaking to You: Contemporary Poetry and Public Address (Oxford University Press, 2012) examines the theoretical and literary history of poetic address, and its social and political negotiations (especially between modernism and the later decades of the 20C). The book focuses on how specific situations - place, date, auditor, audience - inform everyday practices of reading, writing, speaking, teaching, publishing. It offers a view of the literary text as communal process, in which poems address, and take shape from, a transhistorical community of writers, workers, reviewers and citizens. Natalie's third book is a monograph entitled Fugitive Pieces: Poetry, Publishing and Visual Culture from Late Modernism to the 21C. This book attends to literary negotiations of the built environment, which look back on antique, early modern and modernist design models. It considers a range of 20C poetries that engage in site-specific, historical dialogue with buildings and monuments, statues, inscriptions and fragments, reading them as coercive forms that carry argumentations and testimonies through classical, neo-Gothic or brutalist design principles. Chapters include: Djuna Barnes and the grotesque living statue, David Jones’ architecture and sacrament; the neglected dimensions of the intra-active correspondence of Ted Hughes and Leonard Baskin, Denise Riley and reverberation, and ventriloquism in Paul Muldoon. Natalie has recently published a series of articles and chapters on the subject of 'Lyric Economies'. Taking as their focus the relationship between the materiality of poetic place, the politics of space, and present-day anxieties over legacy, materiality, commerce, broadcast, privacy and literary dissemination, these pieces combine book history with formalist methodologies. (They attend to published poems, correspondence between poets and editors, as well as early – often hostile – reviews and commentaries, in order to analyse the creative handling of poetic business since Modernism, such as editorial policies, literary prizes and commissions, marketing strategies, literary group dynamics). In this, the appearance of the printed page comes to appear as a surreptitious species of address; one that calls on poets and readers to negotiate conventions of form, style, typography, book design and value. Much of this work was conducted during Natalie's 3-year British Academy research fellowship (2012-14), during which she organised a programme of outreach events. These included talks at local art galleries, libraries and museums, as well as overseeing the launch of the first Reading Poetry Festival (2013): an event she co-directed with Peter Robinson. The Festival involved collaboration between Reading town and the University, local and global publishers, typographers, publishers and artists. Longer-term, Natalie is putting together essays on global literature for a new book on Not Getting It (particularly focusing on art's positive affective capacity to stupefy, arrest, strike dumb). This project works with staff and students at The University of Cape Town to explore and develop leading posthumanist and new materialist innovations in HE teaching and research, in/through engagement with literatures in English. Unhoming Pedagogies draws on literature to explore its possibilities for developing unhomed, border-crossing and uncannily fugitive knowledge processes (rather than scholarship as something secure, domesticated, belonging). In the long term, the aim is to bring together global participants trialling posthuman and new materialist forms of research and teaching. It will do this in close dialogue with students and with the public, as well as teachers, writers, and researchers across the social sciences and humanities (chiefly Education, Literary Studies, Creative Writing). A key aim is to consider how different HE institutions globally are attempting to include more diversity in terms of what constitutes knowledge... such as in teaching and research practices and outcomes. This might involve including moves to incorporate literary and artist approaches in non-Humanities subjects, and/or non-classroom-based forms of learning, and/or encouraging students to act as co-teachers as part of partnerships with other international or local institutions as part of student-led 'curatorial' activities. It might include a focus on decolonial education, or on storytelling and anecdote, or on wonder, play, stupidity.